I love seeing love locks. They always surprise me. 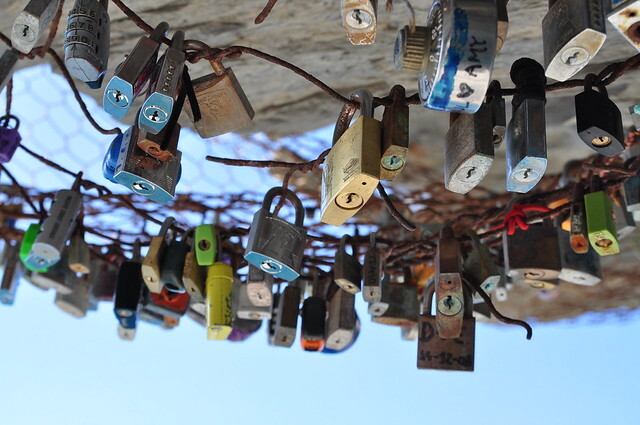 I’ll be walking along, checking out other stuff and then I’ll spot them – a cluster of padlocks, some old and some new, secured to a bridge along some foreign river. I smile. I take a minute to look at all the locks. 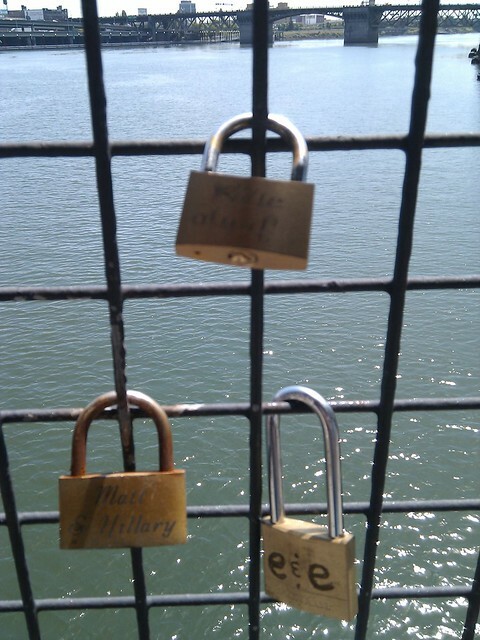 I imagine all the lovers who have chosen a mate, chosen a lock and chosen a spot to put that lock. I think of their hope, optimism and love. And then I think that it’s a bummer that Portland has no such place. Last weekend, I realized I know nothing about my own city. Apparently, even though I’ve said many times that I wished Portland had a place for love locks, I’ve never actually gotten around to verifying that it doesn’t. Last Saturday some of my friends and I walked in the American Foundation for Suicide Prevention’s Out of the Darkness Walk in remembrance of our dear friend Gina, who we lost in college. 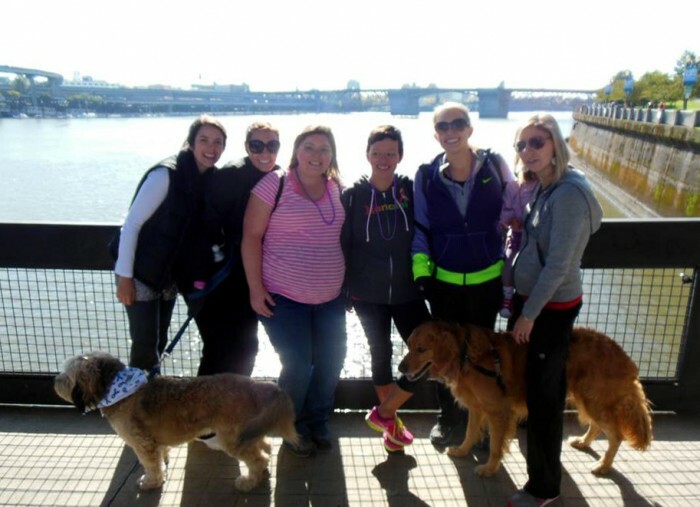 The walk took us from the west side’s Waterfront Park, across the Steel Bridge, down the Eastbank Esplanade and back across the Hawthorn Bridge. It was on the Steel Bridge that I spotted them. It wasn’t my first time walking over this bridge so I’m not sure if they’re new(ish) or if I’m usually just that unobservant. Although, three of my friends were pregnant on the walk and there were three little ones with us, so perhaps our slower-than-normal speed allowed us more time to enjoy and notice our surroundings – including the love locks. What do you want to bet that there was another dog directly to our right who was distracting the pups in our pic. 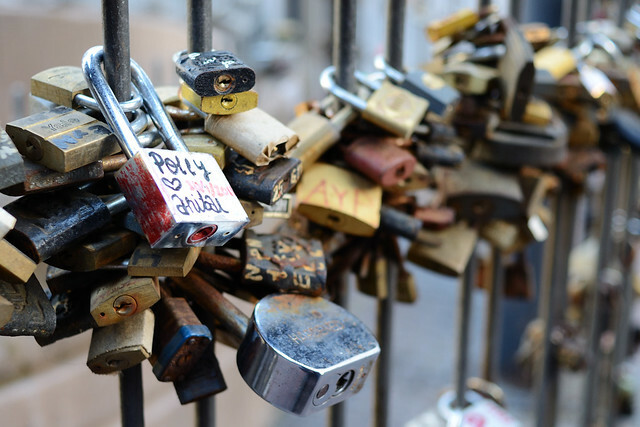 Love locks, for those of you who don’t know or haven’t paused your blog-reading to open up a new tab and Google it, are padlocks that couples secure to a bridge/fence/gate/etc. to signify their never-ending love for one another. Then, after they’ve kissed, they toss the key into the river/lake/ocean/etc. and live happily ever after. 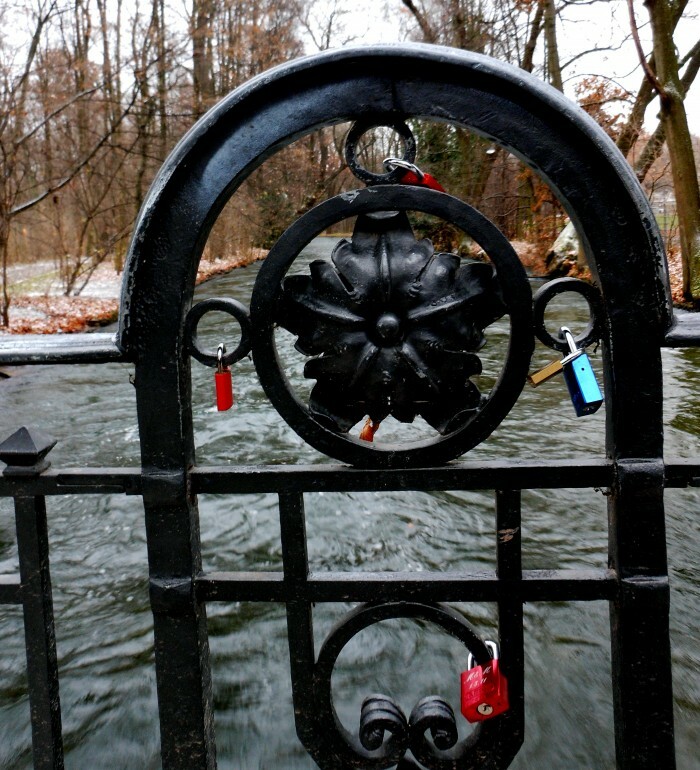 Here are some love locks I came across on a very, very cold day in the Englischer Garten in Munich last winter. 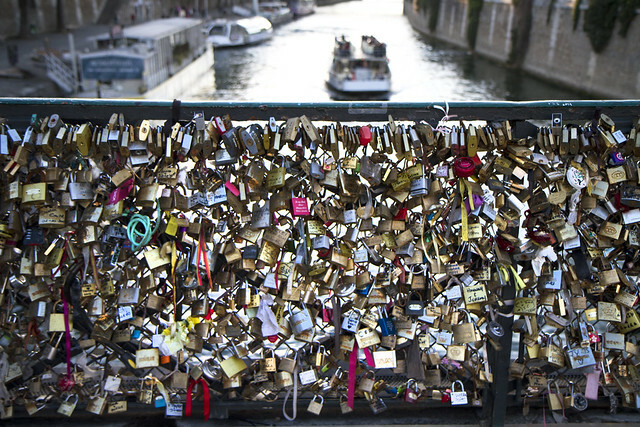 Here’s a couple in Paris who does just that – except they kind of screw up the key throwing part. It’s cute though and they laugh about it so I think they’ll be just fine. Is it a technically a form of littering and vandalism? I guess so. Is it one of the more offensive ways to litter or vandalize? Not a chance. Since the world is already doomed, I think the good done by a little love and whimsy wins out over any damage done by a few keys at the bottom of a river. 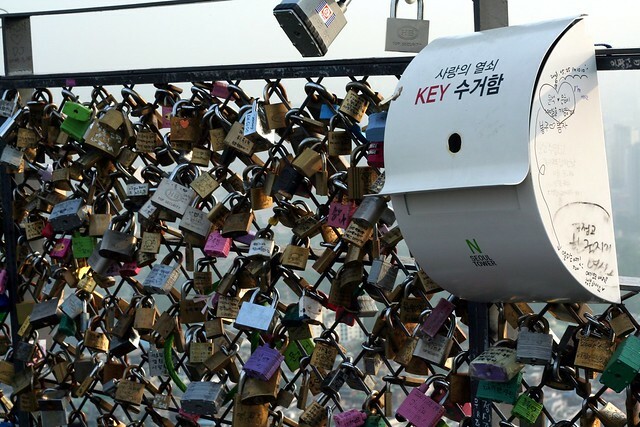 I do remember reading once about a love locks location where after throwing the keys into the river, couples would drink to their love and then the girls would break the bottles and throw the broken glass into the river. This way, if their men ever tried to (metaphorically) retrieve the key from the water and (literally) leave them, they’d get cut on all the glass. This might be a bit too much. Also, I don’t remember where this was, but it was clearly a place with fewer environmental and littering laws than we have here in the U.S. So, broken bottles and bleeding divorcees aside, I think the whole thing is pretty lovely. (On a side note, that might be one of the oddest sentences I’ve ever written). Sometimes cities get mad and cut them off if love a sick couple has mistakenly locked theirs to a poorly thought out place, but overall I think most people appreciate them. 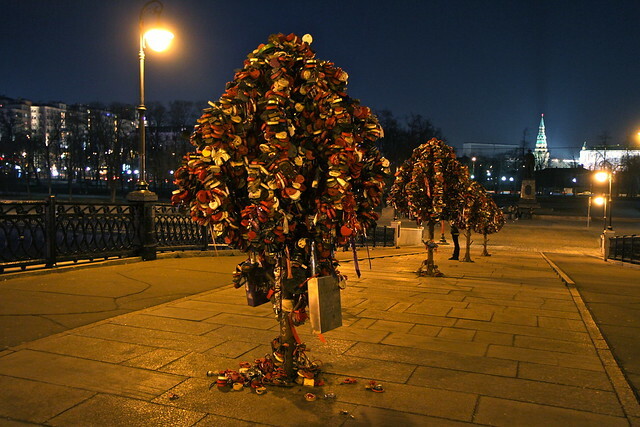 If you want to find out if any love locks locations are near you, check out Wikipedia’s list here. 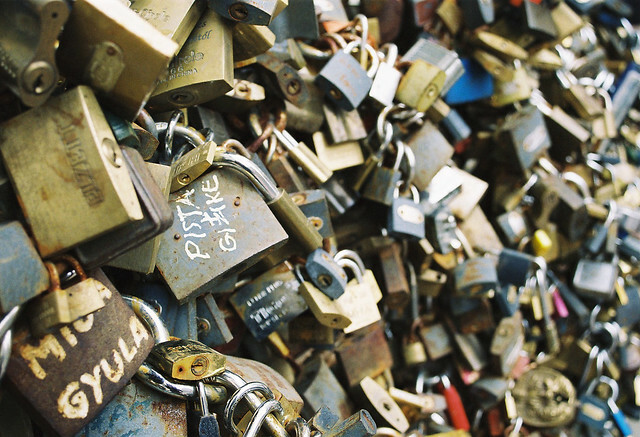 Here are a few pictures of love locks around the world. Weirdly cool. I like it.